This year’s UN climate conference, COP24, will take place in Katowice, Poland, from 2 – 14 December. 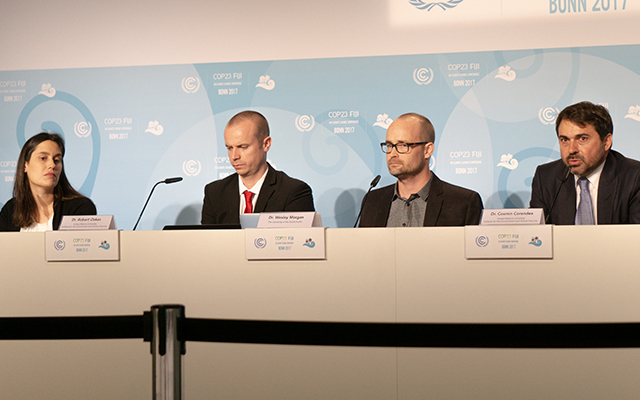 UNU-EHS will actively participate in the conference: We will be hosting two press briefings, and our researchers will be leading various discussions about some of the key thematic concerns of this year’s conference. In the space below, you will find an overview of our activities at COP24. It will be updated as more information becomes available. You can also follow us on Twitter and Facebook (@UNUEHS) to receive the latest information. Time: 4:45 p.m. – 6:15 p.m. Event: Can climate insurance address climate risks while adhering to fair and pro-poor principles? Time: 10:30 a.m. – 11:00 a.m.
Time: 1:15 p.m. – 2:45 p.m.